Vodice is one of biggest tourist centers on Middle Adriatic with rea lization over 50 000 tourist accommodations in Hotels and in private accommodations family pensions, apartments and rooms. 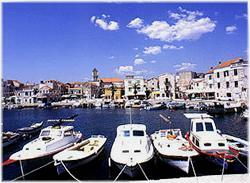 It is situated on the sunny coast of the Middle Adriatic, the area of bright sea. At distance of 12 km from here there is the ancient town Sibenik, a little to the north there is the river Krka, and towards south-west range the isles of Kornati archipelago. Vodice is connected to the outside world by Adriatic road, by the railway from Sibenik and by airlines from Split (70km) and Zadar (60km). Over 50 inns, 20 shops, a modern medical station, pharmacy, a car service shop, an oil and gas station and other public services offer high quality services matching the requirements of the numerous visitors and guests during the summer season. We are trying to give you a clear and comprehensive view of our town, hoping that this will help you to choose vodice as your holiday resort today and in the future. 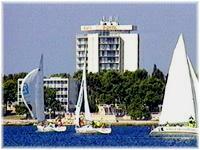 We will justify your confidence and do our very best to make your stay in Vodice unforgettable one.